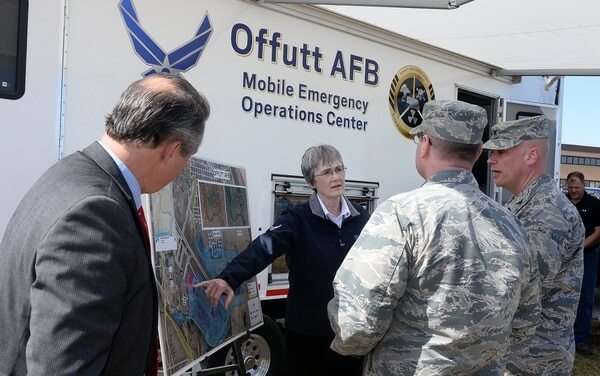 Air Force Secretary Heather Wilson pledged to help Offutt Air Force Base recover from the devastating flood that swamped one-third of the Nebraska base during a visit there Friday. 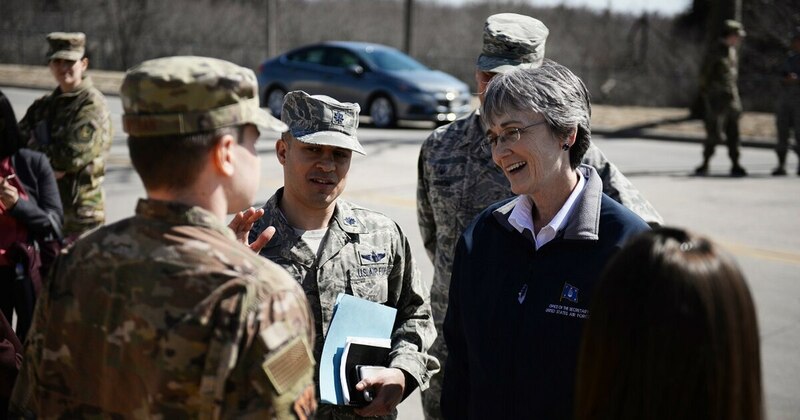 In a Saturday release, the Air Force said Wilson met with Offutt leaders and elected officials in the area — including Rep. Don Bacon, R-Neb., a retired Air Force brigadier general — during her visit to discuss rebuilding the base. Wilson said the Air Force is flying in resources to help the base assess its damage and begin reconstruction. She applauded the leaders at the base, the home of the 55th Wing, for their preparations. And she met with and praised some of the base personnel who prepared for the flooding, including a National Guardsman who spent 10 hours filling sandbags and the wife of an airman who worked at the Bennie Davis Maintenance Facility, who moved items from people’s offices to higher ground. But the Air Force faces a considerable task ahead — and questions remain about how it will pay for it. The Missouri River and Papio Creek’s flooding began overwhelming Offutt March 15, swamping 30 buildings and a large portion of the base’s flightline, and prompting the base to evacuate nine aircraft. Base personnel filled 235,000 sandbags in an unsuccessful attempt to try to hold back the waters. The base last Wednesday began working its way through flood-damaged buildings as waters receded. But the base faces a lengthy recovery process. The Air Force is also growing worried about the lack of supplemental funding to pay for natural disaster recoveries at hurricane-ravaged Tyndall Air Force Base in Florida, and now Offutt. In a roundtable with reporters on Friday, John Henderson, the Air Force’s assistant secretary for installations, environment and industry, said the service may have to start using money from operations and maintenance funds to cover disaster recovery costs if supplemental funding doesn’t come through soon.